Green Roads are renowned for formulating great CBD products, with the most current product being CBD Sourz Froggies. Now you can buy Green Roads CBD Sourz Froggies as an alternative to those potentially harmful over-the-counter painkillers. It is Tri-lab tested to ensure the content is safe and of a high quality. The CBD is extracted safely using CO2 extraction methods. Anxiety disorders: Most of these disorders are characterized by extreme stress and worrying, which cause depression in the long run. Now you can say goodbye to depression and stress with CBD Sourz Froggies. Sleeping disorders: Many find it difficult to sleep during the night despite being tired; the disorder is commonly referred to as insomnia. Thankfully, this product can enable you to have a restful night. Brain disorders: Hemp plant extract has been demonstrated to reduce brain pressure (a high brain pressure can cause seizures). You don’t have to suffer anymore with those acute headaches emanating from sickly brain tissues – just go for this product! Acute pains: Painkillers in various pharmacies have become ineffective because of their harsh chemical components. CBD Sourz Froggies is the way to go in silencing those acute pains in your body. Eye disorders: Sometimes, your eyes may be a source of discomfort, especially when you have a condition like Glaucoma. Nevertheless, you can now have some rest and avoid optic nerve damage by taking CBD Sourz Froggies. Quality: Green Roads CBD Sourz Froggies are tested and approved, hence their amazing quality. They are made from full-spectrum CBD oil, gelatin, citric acid, sugar, hemp seed oil, corn syrup, and added natural and artificial flavors. They come with a mix of two flavors, both sweet and sour, making them delicious to eat. All Green Roads products are tested by Evio Labs, ensuring they have the safest and cleanest hemp plant extract. Effect: Whether you are 81 or 18 years old, this product is safe for you and will give you rest, a calming effect, and silence those chronic pains. 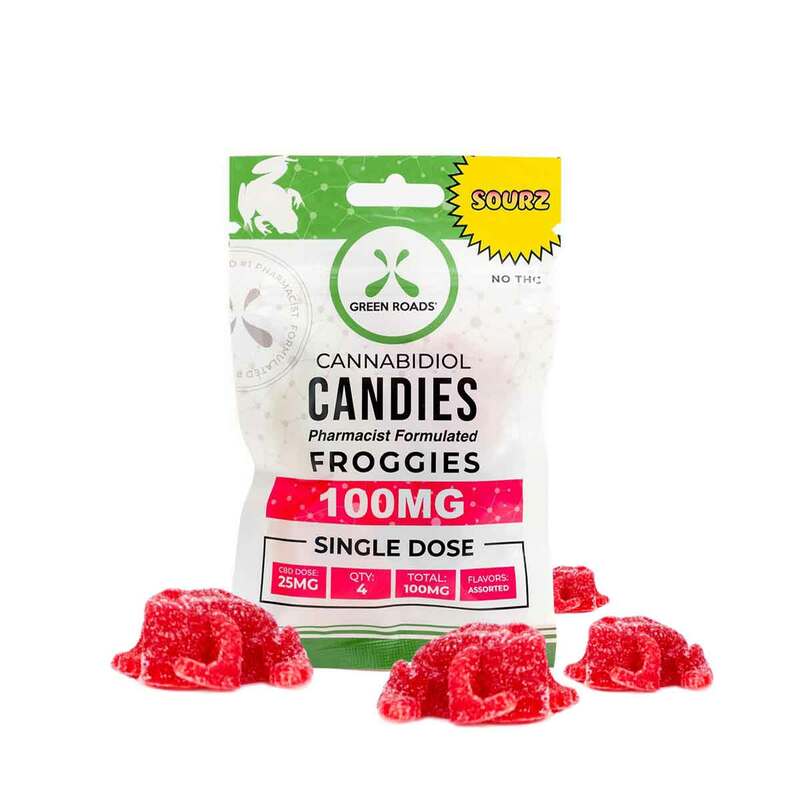 They usually come in packages of four, with each gummy frog containing 25mg CBD, and of course, no prescription is required. Whether you are looking for Green Roads products in various pharmacies or online, you will always be satisfied with the outcome. One of the major ingredients that they use in producing their products is the hemp plant, which gives quality cannabinoid extracts and perfectly works with your body systems. Final Thoughts: Green Roads CBD Sourz Froggies has the best calming feeling you’re looking for. It has great flavors that make it sweet to eat. It is very safe for all ages and is good for treating various disorders. It is organically made from hemp plant extract. Not to be used by pregnant mothers.